Home dead health health news story women worldhealthinfo WOMAN FOUND DEAD FOR A LONG TIME.. WHAT THIS MAN SEE UNDERNEATH HER? UNBELIVEABLE! But there is nothing as extraordinary as a mother’s will to survive when her child’s life is at stake. A discovery made by a rescue group in Asia following an earthquake provides the best evidence of this. 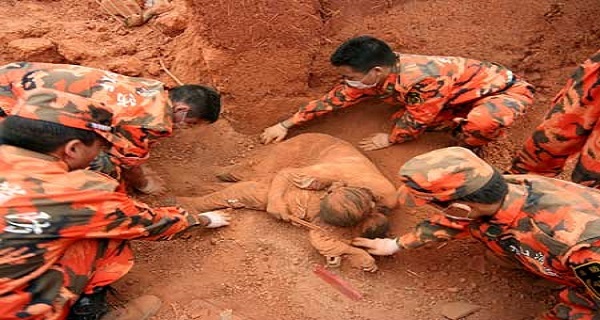 Rescue teams were searching hard for survivors and stumbled upon a woman buried in the rubble of a house. She was huddled up – almost as if she were hugging something. The woman seems to have already been dead for some time. The rescue group sets off to search for survivors but the group leader keeps thinking about the woman they found. Following his intuition, he returns to the scene of the accident and takes a closer look at the woman. He drops to his knees and clears the area beneath her only to make an incredible discovery: A cloth bag drops from the arms of the dead woman. Inside he finds a little boy. Immediately, a doctor is called to examine the child. There is no doubt about it: This mother was determined to give her life for her son’s. Her unbelievable sacrifice has already touched the hearts of millions, as it shows that love always prevails – even over death.